Our range of Relife shoes is here to bolster your casual footwear game. With amazing casual shoes, trainers, comfort shoes and sandals to choose from, you can complete your dressed down and casual looks with ease using any of the shoes below. We have a selection of both women's shoes and men's shoes below, all available at great low prices. Our Relife shoes come with modern, minimalist designs. Their casual shoes include bold design elements and we love the subtle details on their shoes. Our Relife sandals are just the thing for warmer days or holidays. Our Relife trainers come highly recommended and are perfect to beat the streets or run errands in. 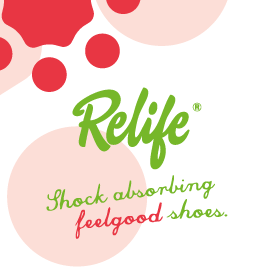 And be sure to check out our Relife comfort shoes. Don’t compromise on comfort for style and invest in some of these well-built kicks. It’s about time we started taking care of ourselves and a comfort shoe is a step in the right direction. Head over to our respective men's footwear and women's footwear sections to browse from our lines of sandals, trainers, boots and more. We specialise in great prices and you’ll be amazed at how much money you could save by shopping here at Shoe Zone. With free delivery on all of our products, including a free click & collect service if that suits you better, you’re sure of great value! 45 products from £19.99 to £54.99.